Can stillness withstand a wounding? Perhaps a definitive answer depends on the nature of the wound, on how deep it goes, but then again, maybe not. Perhaps stillness can, if not withstand, then at least be called upon to serve the cause of healing and wholing for as long as this is deemed possible or necessary. The physical wounding of a body is obvious, in appearance or effect, in a way that an emotional wounding to the heart of soul is not, but even a serious emotional wounding can leave behind apparent and lasting effects that persist for an entire lifetime, or even from lifetime to lifetime. In moving from the subjective experience to the collective experience, let us wonder: what happens when a family, a community, a society, a nation, or even a world sliding ever closer to the brink, doesn’t make the time and space to heal and whole the wounds of its members? Might a collective wound of separation open up and begin to fester? I’ll leave it to you to imagine how this would look and sound and feel. The wound of separation offers the prospect of integration, but only if, as, when, and where close and careful attention is paid to feeling unworthy, undeserving, unloveable, and/or incapable, all the while harmonizing and fulfilling the watcher, the watched, and the watching. Becoming watchful does not mean that you become inactive; action happens through you, although there is no doer anymore. The doer disappears, but the doing continues. And when there is no doer, the doing is spontaneous; it cannot be otherwise. It is the doer that does not allow spontaneity. Osho does not mince words: it is the doer that does not allow spontaneity. If one is looking to heal and whole in stillness, at least a little, one might do no better than to spend some time in a natural setting, walking, wandering, and meandering through trees, in the vicinity of a large body of water, or inside the expanse of a field of flowers or grasses. Even a vicarious experience of same can do wonders. Either way, the opportunity to blend watcher, watched, and watching can be fulfilled alone, if only for a moment in time, kickstarting the process of healing and wholing the wounding through watching. Away from the healing balm of nature’s calming, soothing presence, one is left to contend with a world of manufacture with some measure of nature included as an artful blend or as a mere afterthought. True, we have each other, but the wherein is no small thing. With everyone in this world preoccupied, to one extent or another, with negotiating and navigating matters of survival, safety, security, satiety, and significance, little time remains for healing and wholing. In a world such as this, it is not a simple, easy matter to make the requisite time and space to bring the healing and wholing of a wounding to completion, which is perhaps why there is so much more healing and wholing to be had, which raises a question that begs to be asked. With so little time, can stillness withstand a wounding? Have you ever had the experience of someone getting in your face and raging at the top of his or her lungs over a matter that seemed rather trivial in retrospect? I have, and more times than I can count. The hatred, the contempt, the malevolence spewed are all quite palpable. And have you ever had the experience of one incident of rage being added to another from different ragers to the point where you’ve become a scapegoat for all of the potential ragers and where you’ve become an unwitting suspect in the eyes of everyone around you? I have, and until you have, the admission that “humanity can be cold, dark, mean, harsh, ugly, and evil in the extreme” will make little if any sense. Could it be that a love of innocence and harmony are miscontrued as indifference, or, in some twisted way, intolerance? In the face of rage, watching comes highly recommended. When rage gets intensely personal, a few simple words spoken softly in defense seem called for. More likely, though, watching is enough, with a few tears of compassion added for good measure. Rage is symptomatic of an unhealed wound, and like all such extreme expressions, is preceded by a percolation in consciousness involving a mix of pride, pretense, pressure, prejudice, and presumption. 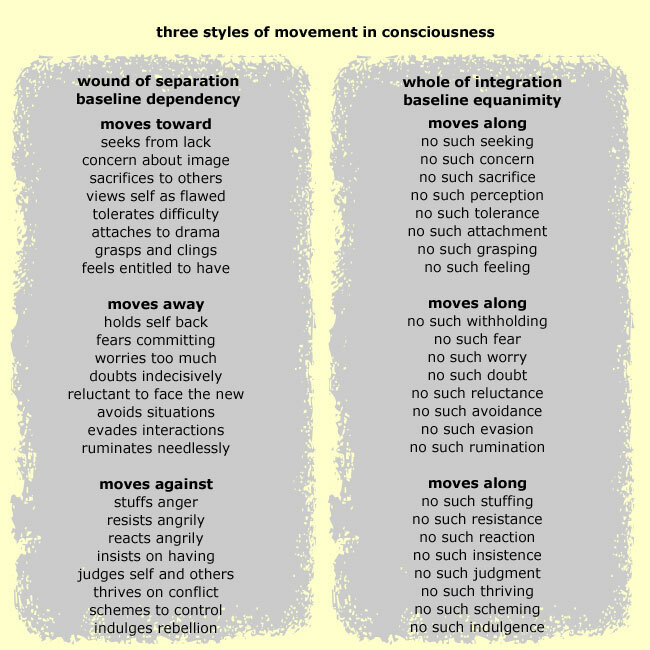 In this light, the style of movement in consciousness that is “moving against” can be seen to operate in tandem with two other styles, namely, “moving toward” and “moving away,” all of which are confessions or expressions of a wound of separation in need of healing and wholing. Stop for a moment and take stock of your favorite movements. Make note of your favorite style. For me, it’s moving away in contrast to moving along, and yes, fortunately, I do also have my moments of moving toward or against, and I say “fortunately” for the simple reason that I can then appreciate all the more the wisdom of moving along. On the side of separation is a wound that calls out for healing. On the side of integration is choiceless awareness in stillness. Let us now explore each of these styles of movement in turn. In moving toward, the center of being is abandoned from a sense of lack or loss, if only for a moment, and the grounding in stillness is lost. The inner grasping after people, places, and things aims to fill up the hole that is the wound, giving one but a temporary feeling of completion. On the side of separation, these movements in consciousness toward the wound in need of integration arise from one of two breathtakingly simple assumptions: I am not enough. I am not good enough. In light of these assumptions, I invite you to review the lists above. The wound gapes to the extent to which the movements arise. When you notice them, pause and be still. Shhhh. With acceptance, allow the feelings, concerns, and urges to arise, as best you can, without acting on them. Be the space in which they arise; relax back into yourself. Come to realize that life itself is complete, just as it is, in this very moment. In moving away, the body tenses, the breath contracts; everywhere is threat ~ or so it seems. Moving away is all about avoiding and evading out of fear, worry, doubt, anxiety, and reluctance. In avoiding and evading, a sense of completion is preserved at the expense of growth. On the side of separation, these movements in consciousness away from the wound in need of integration arise from one of two breathtakingly simple assumptions: I do not feel safe. I do not feel secure. Be honest with yourself. In reality, safety or security might not even be the issue. Restoring a sense of belief or trust in self helps, as does breathing deeply into the moment. Consider, too, that one need not run one’s life in accordance with a constant, neverending stream of thoughts. Here, a daily meditative or contemplative practice is highly recommended. Get into the habit of watching wayward thoughts come and go. Engage with life as it continues to unfold here and now; sidestep the thoughts to be here now. Own the space; with and from and through the senses, open yourself to the wonder of what is here and now. In moving against, a growing sense of entitlement rears it ugly head. In a group setting, it doesn’t take long to figure out who has made a habit of being at odds with the world, resisting almost everyone and everything in sight. Beware, these poor souls are potential raging ragers. Imagine these boiling, roiling pots as infants being rejected and denied again and again. Stuck in anger, frustration, and intolerance, they show up ready for the fight, all too willing and able to take up the struggle and keep it going, while missing out on what is actually here and now. On the side of separation, these movements in consciousness against the wound in need of integration arise from two breathtakingly simple assumptions: I cannot be vulnerable; I must fend for myself. Moving against, however, is a defensive posture that bypasses any sense of vulnerability. Everyone is susceptible, myself included. Get in the habit of asking yourself: what if I allowed myself to open tenderly and vulnerably to the reality of what is happening here now, just for now? A whole lot of precious effort is required to face the world primed and ready for a fight, but is there really anything to protect inside a pinched space of resistance and insistence? Feeling into the sensations of anger, take note of the effortlessness of being open, soft, receptive. Relax into the moment and the movement, meeting and greeting life as it comes, and goes. Consider yourself fortunate if you have an art through which to process feelings. For me, I fall back on writing. For you, it might be sketching, painting, or sculpting. Or maybe singing, dancing, or acting. Or perhaps gardening or woodworking. Or even the fine art of conversation. When I write, I hold a space in consciousness to watch the movements of consciousness. As energy flows where attention goes, I pay close attention to moving toward, moving away, and moving against. True, I’m not always successful, but that’s okay; it’s all part of the process. The forementioned strategies of moving toward, away, and against use up precious energy, preventing the heart of soul from relaxing deeply into the moment, into that infinite space where you come alive to knowing and feeling what is real, true, good, right, fine, and pure for you. Try not to let these twenty-four movements in consciousness turn your life into a living hell ~ it’s simply not worth it. Rather, feel into the movement without getting sucked into manifesting the movement. In the art of healing with the healing of art, open up to the love of watching the movements without feeding them the energy that would make them feel any more real, relaxing into that zero point of stillness where everything is possible, unmoving yet wholly available to life itself. The antidote is quick and easy: pause; be still; let flow. Submit and transmit. The ultimate magic trick is in remembering not to do, but to merely watch.